The Chatham Fund, part of the Cape Cod Foundation, has awarded PBCB a grant to support programs that benefit residents of Chatham. The grant supports PBCB’s First Sail, Monomoy Community Services and Senior Sailing for Chatham Council on Aging programs–all free sailing and instruction programs for community members who would not otherwise be able to access Pleasant Bay. 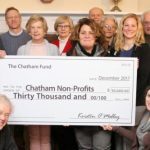 Established in 2012, the Chatham Fund awarded a total of $30,000 in grants to ten local non-profit organizations, supporting a variety of programs. Click here to read the Cape Cod Chronicle’s coverage of these awards.